The Professional Bios that you are working on are a kind of career document, like a resume. You are summarizing your qualifications, showing what you bring to a company or organization, and demonstrating how you will fit in with coworkers or what you can do for potential clients. Infographic resumes focus on these same goals, using visuals and document design to highlight the author’s qualifications and accomplishments. These flashy career documents have limited usefulness, of course. Most companies look for more traditional resume presentations. Please do NOT think that I am recommending that you redo your resume as an infographic. That said, you can gain some interesting perspectives from looking at how document design and visual elements are used in these documents. Take a look at the infographic resume below for Geoff Hamby and consider how the design and layout highlight the information in the document. 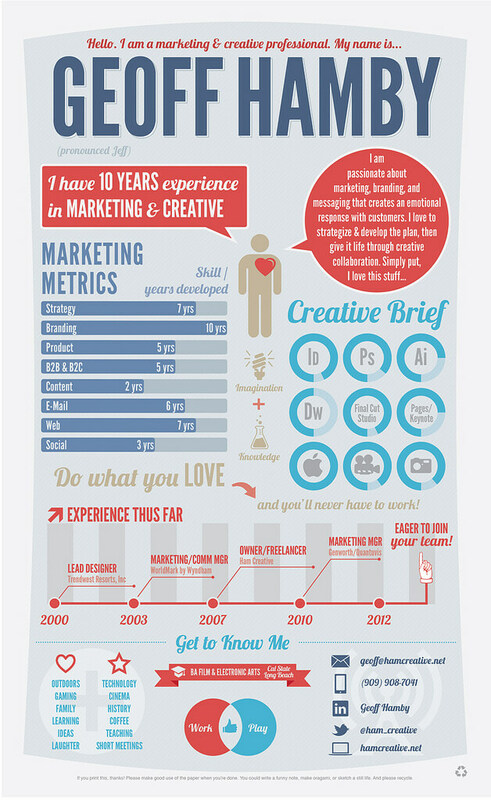 You can also consider The Muse’s 4 Rules for Creating a Killer Infographic Resume. What do you notice in these visual resumes that you can use to make information in your professional bio stand out? How can you use document design and visual elements to present your bio while still fitting into the traditional expectations for a professional bio?